Reading and share top 7 famous quotes and sayings about Role Models In Life by famous authors and people. 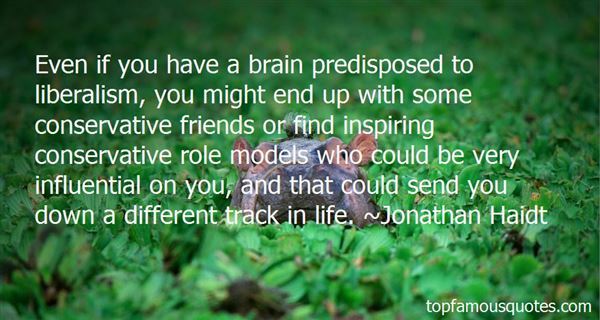 Browse top 7 famous quotes and sayings about Role Models In Life by most favorite authors. 1. "Children, as persons, are entitled to the greatest respect. Children are given to us as free-flying souls, but then we clip their wings like we domesticate the wild mallard. Children should become the role-models for us, their parents, for they are coated with the spirit from which they came- out of the ether, clean, innocent, brimming with the delight of life, aware of the beauty of the simplest thing; a snail, a bud...."
2. "Even if you have a brain predisposed to liberalism, you might end up with some conservative friends or find inspiring conservative role models who could be very influential on you, and that could send you down a different track in life." 3. "I don't know that I have any role models now that are fixed. Definitely my mom - she's the coolest. She's worked really hard her whole life and I just think she's got a great attitude. Moms just know so much it's so silly." 4. "My mom is one of my role models in a complicated way. I learned from her how to be a good mom. She was one of those natural moms who really took to it. Her chosen profession was teaching. She loves kids. But she was extremely frustrated and unhappy because for much of my life she was a stay-at-home mom." 5. 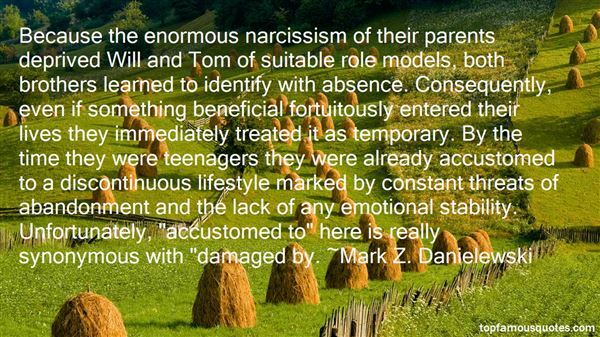 "Because the enormous narcissism of their parents deprived Will and Tom of suitable role models, both brothers learned to identify with absence. Consequently, even if something beneficial fortuitously entered their lives they immediately treated it as temporary. By the time they were teenagers they were already accustomed to a discontinuous lifestyle marked by constant threats of abandonment and the lack of any emotional stability. Unfortunately, "accustomed to" here is really synonymous with "damaged by." 6. "Role models are only of limited use. For no-one is as important, potentially powerful and as key in your life and world as you." 7. "Teenage girls today need strong, positive role models that can show them how to be independent thinkers and confident decision-makers. Dana is proud and self-confident, which is good, but she does not always make wise decisions. Rather than make her a super woman, I balanced her with difficult situations that could have been handled better. Her strength, however, shines through. This way, a young woman can read the book, discuss Dana's actions, and reflect on the decision-making in her own life." I stand up. Stretch my arms out wide to theempty horizon. Do not be afraid of limitlesspossibilities. The desert is infinite to the eyeas love is to the heart."